Bloggers4UKIP: Cameron warns that terrorist attack on the UK is "highly likely"
Cameron warns that terrorist attack on the UK is "highly likely"
David Cameron has warned that an attack on the UK is "highly likely" after the terrorist attacks on Paris. French officials have so far confirmed that two of the terrorists entered Europe through Greece, posing as refugees. One of the terrorists - a Belgian resident who was able to take advantage of the non-existent border - is still on the run. At home, Theresa May and the Met Police Commissioner have casually announced that as many as 450 people who travelled to Syria to join ISIS have returned to the UK and that undercover armed police and soldiers will be patrolling public events and train and tube stations. 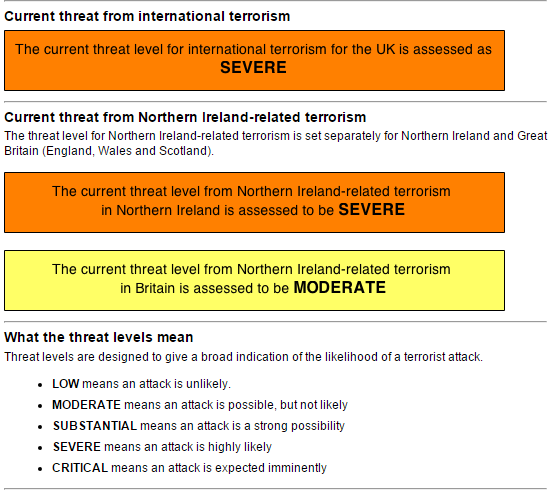 David Cameron's warning is nothing new - MI5 still have the UK national threat level set to "severe" which is what it's been since 2009. If an attack was imminent the threat level would be "critical". Cameron is unwilling to deal with mass immigration or abandon policies of appeasement but he is willing to protect our rights and freedoms by taking them off us. In the next few days we can expect new "anti-terror" laws to be announced which will do nothing to stop terrorists but will take rights and freedoms away from the 64m people living here who aren't terrorists. Such legislation does nothing to make us safe but it's an established pattern. Nobody apart from terrorists and fundamentalists want terrorist attacks in the UK but turning the country into a police state in the name of protecting us from people who want to turn the country into a medieval religious state sort of defeats the object.